To garner support and to spread awareness of the negative effects of net neutrality, five students are urging students to sign a petition. 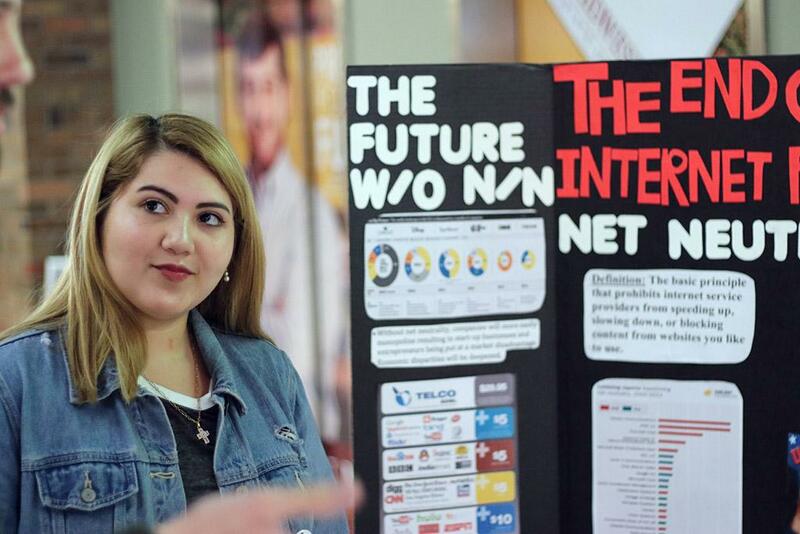 “We are student group in Dr. Kataria’s Special Topics class that is starting a social movement to inform the implications of the repeal of net neutrality that will begin on April 23,” Rolando Diaz, business management senior, said. Net neutrality is the idea that Internet providers should provide access to all legal Internet services. In December 2017, the Federal Communications Commission repealed net neutrality making it an issue of states’ rights. Though net neutrality has been repealed, the effects of its repeal will not come into effect until April 23. States such as California and New York have made bills supporting net neutrality policies. Diaz, along with Taylor McCreary, business management junior, Elizabeth Chavarria, business management junior, Graciela Ruiz, accounting and business management junior, and Joe Hankins, business management senior, are hosting booths in the Dillard Building urging students to sign their petition showing support for the net neutrality policies. 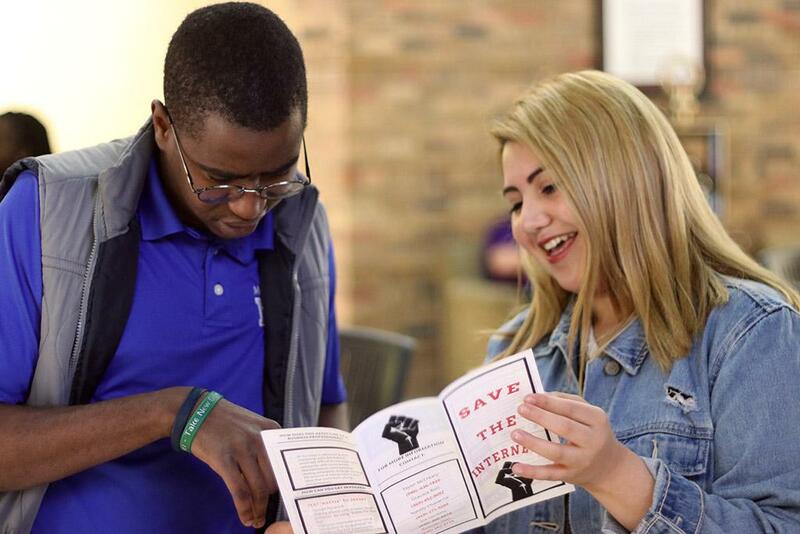 The group met with Santellana and Jesse Brown, district 4 councilor, on April 10 in the Clark Student Center to discuss net neutrality and to ask for their support. According to McCreary and Ruiz, Santellana believes there is going to be more time and effort needed in order to see change regarding net neutrality and believes in the power of states rights. “We really didn’t get much out of it [talking to Santellana] besides a nice discussion,” McCreary said. When she heard the idea of starting a movement for net neutrality in her business management class, McCreary, said she knew she wanted to be a part of the movement. “When I heard that, I didn’t even have group members yet and I was like, ‘Whoever is in my group, we’re on this. We’re going to do this and I think we can get noticed,'” McCreary said. As of April 5, the petition had more than 300 signatures and Diaz said this is something people need to bring attention to and focus on. For students, having to budget the cost of living while paying for school is a difficult task, and adding additional costs to that through heightened Internet bills may make the task even more difficult, so Diaz said this possibility “doesn’t sit well” with him. “The cost of living is too high for us and to have our Internet turn into a cable company for an extra payment, to me, doesn’t sit well and if we get this out to everyone else, it won’t sit well with them either,” Diaz said. To McCreary, repealing net neutrality will make it easier for companies to discriminate certain Internet sites. Those involved in the movement urge students to go to the Dillard Building and sign their petition in the hopes of gaining support from congressman Mac Thornberry as the number of signatures on their petition has grown to more than 500.